As part of our 'Meet The Team' series we ask our sales team what they think is the ultimate hospitality experience for our VIP guests and what their ideal hospitality would be for, next up we have one of our Account Directors Gareth Burch. My job at Hospitality Finder is an Account Director so I look after a portfolio of around 500 clients, managing their hospitality requirements and making sure we can book them into the events they are after. The most popular ones I like to sell are rugby, horse racing and golf, I just think with the rugby and the horse racing the atmosphere is absolutely fantastic at all the venues. I really enjoy selling the golf hospitality packages as I am a keen golf enthusiast myself. Out of all the events we have on offer what would you say is our most popular one? We do have so many events on offer, and there are varied ones to suit customer’s different tastes and budgets, but if I had to pick one I would say the most popular event we have at the moment would have to be Twickenham and The Green Room. It’s really popular, the clients have a great time there and it is always a sell-out event. Thinking of all the events that we do, which one would you want to experience hospitality at? Definitely the US Masters, I am a keen golfer and play a lot of it in my spare time, so for me that would be the ultimate trip combined with great golf hospitality. You have been to a few different events, which one has been your favourite to work on? The Cheltenham Festival, due to the atmosphere that you get at the event, it’s like no other one that I have been to. There are a lot of people from all walks of life at the festival, you have people who are celebrating with small groups of friends right up to large corporate bookings. You will always experience something different when you go, which is why our customers keep booking year on year. It gets pretty busy, we have to be extremely organised beforehand, but it’s great once everything is set up and you see the customers experiencing facilities like The Green Room for the first time. 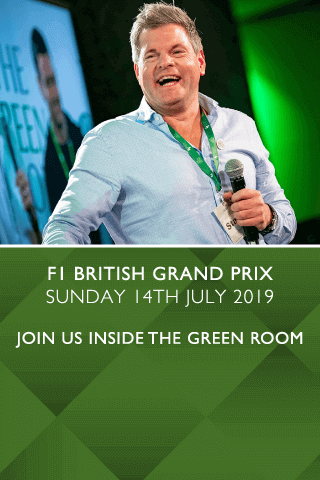 It is a really popular event but I would say The Green Room at Cheltenham is going to be a brilliant experience for our clients. I would have to say something like the US Masters or the Monaco Grand Prix, both are very high end events and provide great hospitality experiences. With The Green Room moving from Twickenham to Cheltenham, what elements of the suite do you think will work well at the festival? I think all of it will work well, the guest speakers, past and present greats from the sport and celebrities, they are all really going to make the facility.